I feel quite proud of myself and consider this a sign I’m making progress with my new Spring Goals, specifically number two – Think of at least one fun activity I can do with the Little Chap for each week and schedule them in my diary! Forward planning is the answer. I don’t normally stay home with the Little Chap on a Thursday, but having made the difficult choice to move him from one day nursery to another at very short notice this week (a subject for a later post, perhaps) and as he had a settling in session on Monday afternoon, on top of his usual full sessions on Tuesday and Wednesday, I thought it a little mean to subject him to a third long day on top. Oh the additional parental guilt! Anyway, knowing that I would be at home with no regular classes and not knowing if we could muster a social occasion at short notice (we did – yay! ), I thought I’d better be prepared to get involved and lead the day’s activities or it would result in a day of whining and moping from both of us! The Little Chap himself has been asking me regularly for “something new Mummy” from his arts and crafts box, not satisfied by a Mister Maker crafts box of all sorts of bits and pieces from pipe cleaners to pom poms! He’s already brought home an Easter card, an Easter egg and a chocolate krispie cake after just two days at his new nursery, so I guessed he might be in the mood for something crafty. I also felt a little guilty that he would be missing the nursery’s Easter Bonnet Parade (Shh! Don’t tell him!) that was scheduled for today. I wouldn’t have been able to muster up anything vaguely resembling a bonnet in time anyway, so it was just as well. So, I ended up ordering these little chums from the Early Learning Centre and justified the postage cost by simultaneously adding a few sale bargains for forthcoming birthday presents and some MYO Easter cards! I mentioned “forward planning” as key, but truth is I ordered these in my lunch hour at work on Tuesday. Nonetheless, for the cost of next day delivery (justified as above! ), the bounty arrived and was ‘hiding’ behind the flowerpot in front of our front door when we got home from nursery yesterday. The recommended age was 3+ which is fair, although I have to say that, perhaps due to my inner control freak, I did feel the need to cut out the shapes required to make the baskets so the Little Chap could help me glue them together for fear of completely wasting my money (parenting fail..?). With some careful instruction from me, the Little Chap duly made these cute animal chums, helping me to glue on the ears/beak etc and indulging his own control freak by instructing me which basket frills to glue on and in which order! He also glued on the eyes and stuffed the baskets with the “grass”, glueing in the animals when we were done. Despite this and my speediest efforts at cutting out, he still got a little bored with it after a while. It might have been better if the card had come pre-printed with cut out lines (as they do in the CBeebies magazines etc). As it was, it came with instructions suggesting the use of tracing paper (oh yeah! my house is just busting at the seams with the stuff, don’t you know?)! When we were kids, we used to use IZAL toilet paper (yes, paper – not tissue!) but thankfully that stuff seems to have gone out with the ark so we have to be a little more ingenious these days…! As it was, I made do with some clever folding which allowed me to cut out all three colours simultaneously to obtain the correct number of ‘pieces’ in each colour. I think between us, we’ve done a pretty good job and I enjoyed it as much, if not more, than he did (grins). Perhaps next time I’ll order two sets – one for him and one for me..! Anyway, enough about my guilt. 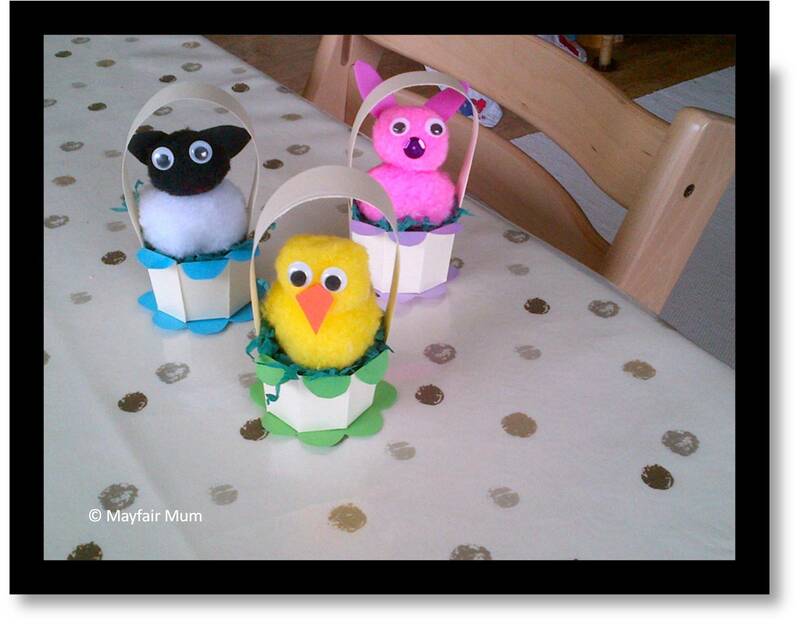 What crafts have you and your Little People got up to this week in preparation for Easter? Do drop in and let me know – even link me to a picture or write on your own blog/Twitter/Flickr if you like. Have a happy and peaceful and chocolate egg filled weekend break – the diet starts on Tuesday! This entry was posted in Little Chap's Gallery, Making & Baking, Memory Lane, Parenting & Family, Reviews & Recommendations and tagged crafting, family life, kids, Little Chap, Mayfair Mum, reviews, toddler life by Mayfair Mum. Bookmark the permalink. Super cute. We made Bunny Food for our family and neighbors this week. Mostly a mommy activity but the kids sprinkled the M & Ms and the sprinkles. Not my activity but I wish it had been. That’s a great idea! Will bookmark this for next year! We made chocolate krispie cakes last weekend and all my son wanted to do was eat the chocolate! Nice to meet you Emily. Such cute chicks! I love your blog and have added you to my blogroll as I’m sure I’ll be coming back!